After obtaining his medical doctorate at the Medical College of Virginia, Dr. Missaghi pursued his training in anesthesiology at the University of Virginia. He subsequently came to the Valley and took a position as the co-director of pediatric anesthesiology at Maricopa Medical Center, where he was among a few nominees for the Physician of the Year Award in 2009. He has cared for hundreds of infants and neonates undergoing complex surgical procedures. He is a seasoned pediatric anesthesiologist who also provides acute pain management services and follow-up for children in the post-operative period. He has significant experience in burn and trauma anesthesia care. He is Board Certified in Anesthesiology. 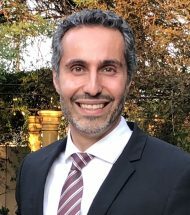 Dr. Missaghi has nearly 10 years of practice management experience, serves on various medical executive boards, serves as the medical director for a few surgery centers, and is involved in quality control committees, drafting policies and procedures, and improving compliance in places where he practices.